This is the season for weddings, birthdays, graduations, and more. And there’s no better way to celebrate a milestone than with a party! 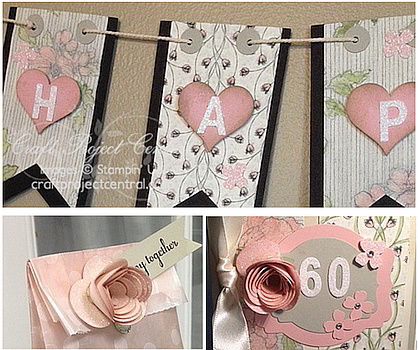 In this tutorial you’ll make a fun banner and treat bag and a beautiful card using exclusive Stampin’ Up! framelits and thinlits. I’ll show you how to customize your glimmer paper, treat bags, and designer series paper as well for a unique look that will please the party-goers. This project is designed for an anniversary, but it’s easily customizable for any occasion by simply changing the designer series paper and the sentiments on the banner and card.